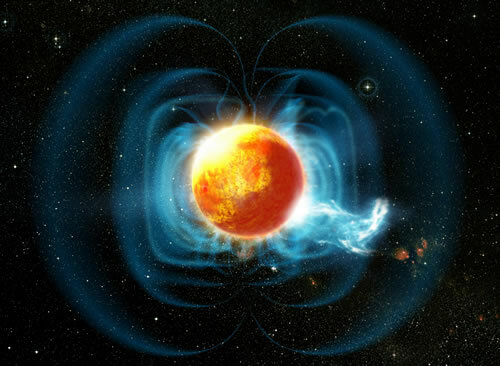 A dwarf star with a surprisingly magnetic personality and a huge hot spot covering half its surface area is showing astronomers that life as a cool dwarf is not necessarily as simple and quiet as they once assumed. Using four of the worldâ€™s most powerful telescopes, astronomers have found a bizarrely magnetic star with some very strange features. The M-type dwarf has a massive â€œhot spotâ€, which covers half of its surface area, and an unusually active magnetic field. The star lies about 35 light-years away in the constellation BoÃ¶tes. If these strange â€œanomaliesâ€ turn out to be common for M-type stars, astronomers will have a radically altered view of the ultracool dwarfs. We find a hot spot that covers half of the surface of the star like a giant lighthouse that rotates in and out of our field of view. We still do not know why only half of the star is lit up in hydrogen and if this situation remains unchanged over days, weeks, years, or centuries.